Bitcoin Investor has a short web presentation with a video. In the video you will only see short clips with famous people like Bill Gates or Richard Branson talking positively about Bitcoin. The rest of the webpage is emphasizing how much you could have made on Bitcoin, if you started investing a few years ago. Then it encourages you to buy Bitcoin now. The truth is that the Bitcoin Investor presentation is very misleading and contains also one thing that makes it a total scam. 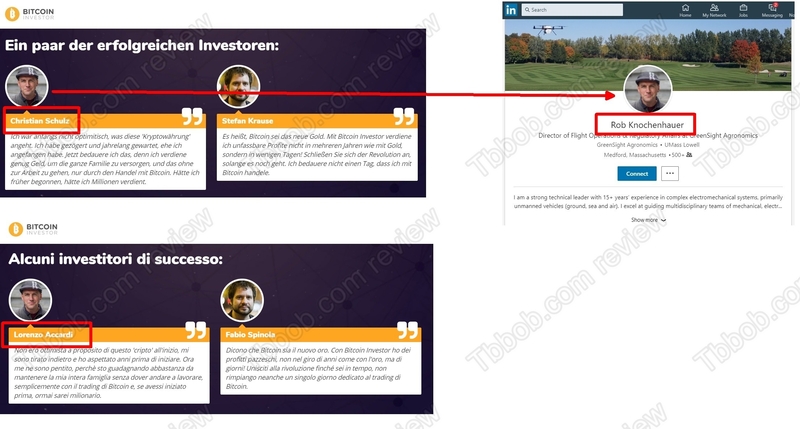 The thing that make Bitcoin Investor a scam is the testimonials that can be seen in the German or Italian version of the webpage. As you can see on our picture, these reviews are totally fake, made with stolen photos and with fictitious names and fictitious stories. Another big problem with Bitcoin Investor is how misleading the presentation is. It uses old statements from Gates who is now against Bitcoin. It also purposely is hiding recent price history of Bitcoin. It is trying to make you believe that Bitcoin has been only rising, but it is not true, since December it is falling down, it has lost most of its value since then. If you bought Bitcoin in December, you’d have lost 60% of your money now. So, you see, it is not just about buying, cryptocurrency investing is more complicated than that. Bitcoin Investor is not hiding that it wants you to immediately deposit at least $250 with a broker called eToro. The reason is obvious, people who run this scam are getting paid by eToro for referring new depositors. This is why they’re doing it, they want to earn money thanks to your deposit. They don’t care if you then lose your money. 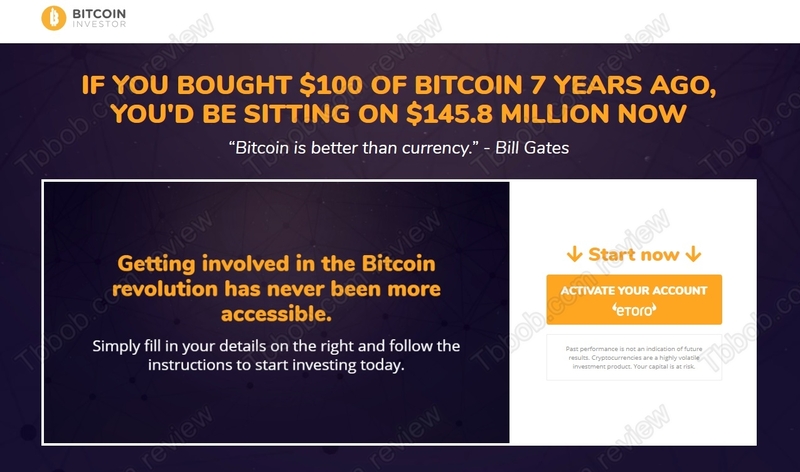 Bitcoin Investor is a scam that is telling you lies and misleading information. Stay away from it. If you want to make money with cryptocurrencies, you should start training on a free demo account first to see how it works and learn everything you need. You first have to understand all the risks and prepare your strategy before you can start investing real money.